Sold Out Editions Currently Available - Click Here for More Info. The Kinkade family delights in travel. One of the recurring discoveries is Charleston, South Carolina, where the heart of the Old South lives on. The feeling that I get when I visit Charleston is nostalgic, romantic, as if I had somehow stepped back in time. 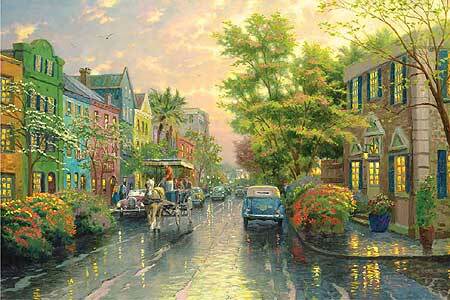 So, as I worked on my studio treatment of "Charleston, Sunset on Rainbow Row", I've filled my streets with vintage cars and passersby wearing simple yet timeless garb. Step aboard the horse-drawn carriage for a leisurely visit to Rainbow Row! "You made this ancient stone bridge an artistic monument that I must revisit. 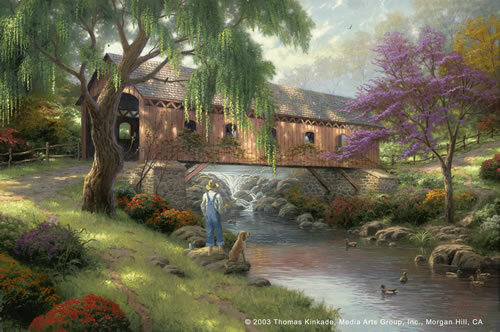 When I issued Cobblestone Bridge some years ago, this celebration of life in the Hampshire region of England quickly became the best loved of all my village scenes. .as he is never alone in battle. The weight of all he has seen and done, of the pain he has borne and the trials he has overcome bear down on his broad shoulders. The soldier's personal war is over: he is "Heading Home". 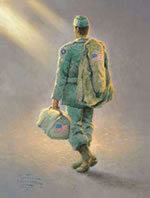 The hero of "Heading Home" is not an individual at all; he is the essence of the American soldier. We cannot tell whether he returns from Normandy, from Saigon, from Beirut. In a sense, he has spilled his blood on all those fields of honor. Like all of us, the soldier walks the path of his life and finds himself under God's watchful eye, alone. He is bathed in a golden light that can only be called"heavenly". Like all God's children, his ultimate destination is a heavenly home, where he can know the sweet peace of divine love. We can only wish him a joyful homecoming, and say a sublime word of thanks to the heroes of every generation! In "The Good Life", third and final piece in my Beginning of a Perfect Evening collection, I have in effect set up my easel in that imagined space where God's bounty is manifest. I identify with the fisherman, who lives in a profound harmony with nature and receives its gifts with humble gratitude. Towering peaks embrace the valley. I imagine that my wife and daughters are safely tucked away within, enjoying the pleasures of domesticity, as they await my return with the evening catch. Alone with my family, safe, peacefully savoring the glories of God's creation - that is my image of The Good Life. I invite you to enjoy it with me. "Friendship Cottage brings one of my most extended series to a satisfying close. 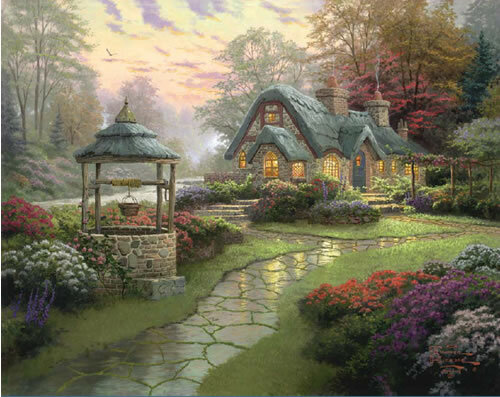 The new issue began in my imagination as a lovely walkway, honoring the path of beauty I've traveled with my "family" of Kinkade collectors. 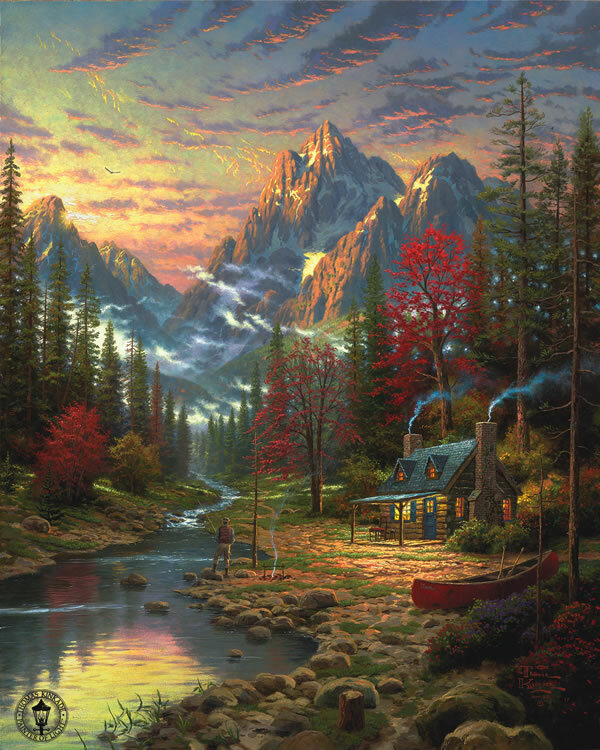 I became intrigued by the idea of tucking a cottage away at the end of the path, to symbolize the imaginative "home" we share. 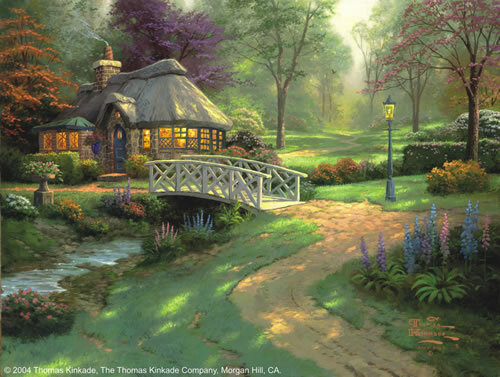 Friendship Cottage comes with a special free offer for Thomas Kinkade collectors to remind us how very important a treasured acquaintance can be. Here we can savor the joys of good fellowship." 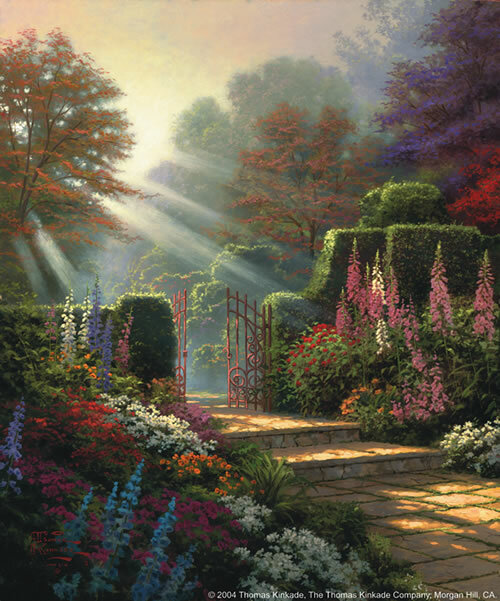 How sweet, too are the sights that await us in the Garden of Grace. And the scents. I think of a melodious harmony of bird song, of the heady perfume of flowers wafted on the breeze. Above all, I imagine a glorious light that pours through the foliage, clothing the trees and shrubs in its resPleindent radiance. What can lie beyond the aged, wrought iron gate that opens into the Garden of Grace? Surley, abundant blessings and God's tender mercies await. The moral order of God's universe is like an exquisite tapestry, the foundational values of the good life interweave in a seamless whole. In my Life Values Collection, I explore the connections between these divinely inspired values. "Courage", my new Life Values painting, expands on the metaphor of a sea voyage, bringing us to the moment of divine inspiration, when God graces us with courage beyond the merely human - the resolve we need to overcome any obstacle. 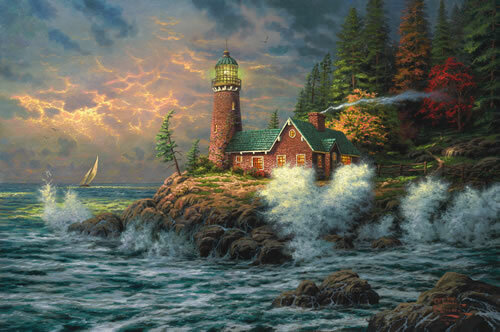 Our lone sailor has come within sight of a lighthouse, the beacon of divine love will guide to shore. Smoke curls from the chimney of the keeper's solid brick cottage, hinting at domestic comforts within. A sublime radiance breaks through the clouds, embracing the boat in its holy light. I painted "Courage" at a time when I was especially grateful for God's hand of deliverance in my life. May it remind you that courage is, truly, a gift from the Almighty. For my four lovely daughters, and all the children who dare to dream, I've created "Make A Wish Cottage", a sanctuary where dreams come true. How sweet it is to imagine the wishes that children have whispered into the mossy depths of this old wishing well. "Make A Wish Cottage" is lit by the light of love. The gardens here are lavish with flowers; red climbing roses encircle the thatched roof like a crown. The stream that flows beside the cottage and feeds the well symbolizes God's abundant blessings. Now, more than ever, New York is America's city - a symbol of our indomitable spirit, our energy, our roots in a proud past, our confidence in the future. New York is the most theatrical of American cities. Like a director, I can assemble stage settings that combine reality and imagination to evoke mood. That's what I've done in "New York, Fifth Avenue". 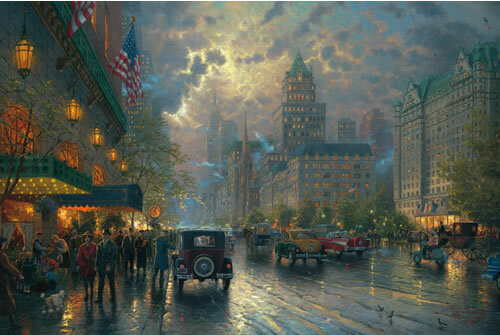 I've intentionally made this a timeless image of New York, as two-wheeled hansom cabs and classic American automobiles patrol the busy streets. The essence of the great city, as the essence of the country it so nobly represents, remains the same throughout decades past and into the future. 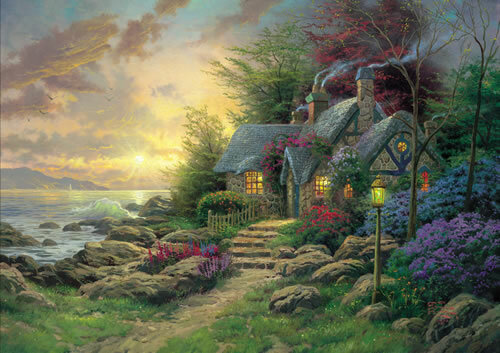 In "Seaside Hideaway" , spray from the breaking waves drenches the air with mist and a radiant light bathes clouds and swells with its golden glow, until the eye can scarcely tell where sky ends and sea begins. The cottage hideaway is enveloped in flowers and graced by climbing roses - the lavish palette of sunset paints the cottage as well. Warm lights gleam through the myriad windows and we can just imagine the cozy, congenial scene within. Some months ago, I unveiled a painting entitled "The Light of Freedom" which portrayed a dramatic American flag unfurled over the New York City skyline. I was intrigued to discover that many collectors asked if I could create a reinterpretation of this painting celebrating other American cities. The idea stuck with me, and has now inspired a brand new collection of works which I am calling "Flags Over America". 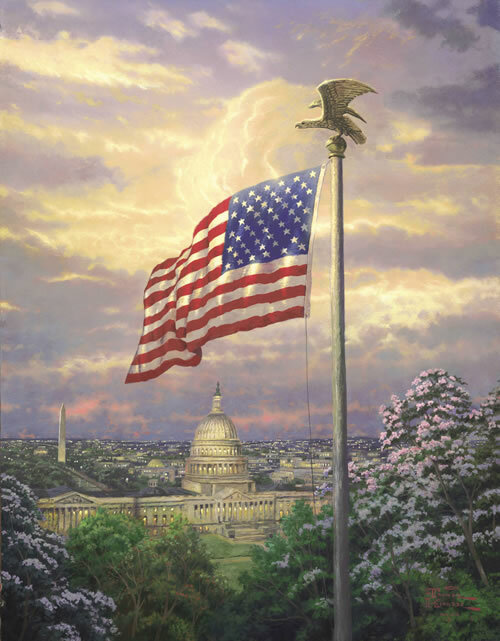 "America's Pride", the first piece in my new collection, features the same dramatic sky and waving flag seen in my previous painting, while below I pay tribute to the most patriotic of all American cities - our nation's capital. There is no doubt that for all citizens of the United States, our nation's capital truly is "America's Pride." When Jesus performed his first miracle, turning water into wine at a wedding feast in Cana of Galilee, he clearly was celebrating the overflowing of God's blessing for those who commit their needs to Him. 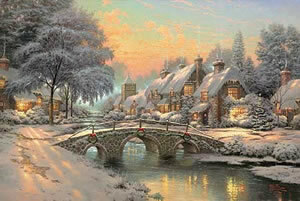 To me, this painting is symbolic of the rich blessings that flow to us from heaven. 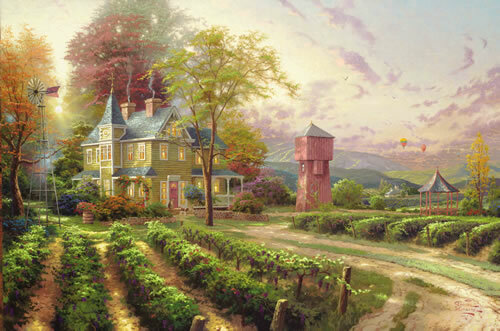 In this work, I have portrayed a classic Napa Valley vineyard estate, complete with stately Victorian house, water tower, weathered windmill and trailing grapevines. How pleasant to sit in the garden gazebo as the morning sun spills over the horizon and contemplate a slower pace of living. Even the ubiquitous hot air balloons, now a daily feature in Napa Valley, testify to a pace of living as entrancing as a gentle breeze. Each of us, in our daily life, reach obstacles and chasms that can only be bridged by God's miraculous love and divine plan for provision. I strove to portray an image of solidity in the context of the delicacy of nature. The "Bridge of Hope" is as stable as the massive granite flagstones that form its arch and will stand for as long as the quicksilver brook rolls down from the hills beneath it. 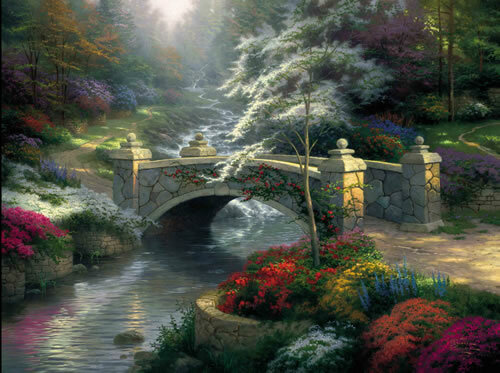 A magnificent white dogwood, symbol of the purity of God's grace, shades the bridge. Its over-arching boughs remind us that we are enshrouded by the loving embrace of our creator. 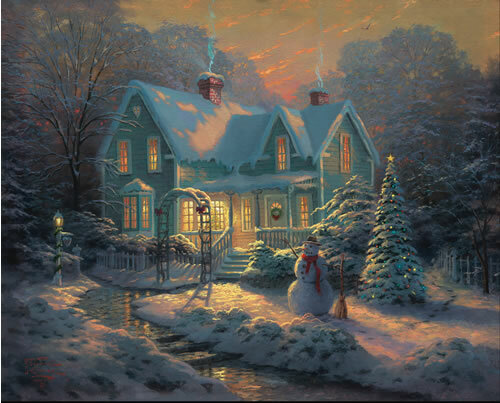 I've chosen to re-visit a favorite artistic place in "Blessings of Christmas" which takes a fresh look at the charming cottage of "Home Is Where The Heart Is II", but now in the snowy grip of winter. The warmth of family life lives in this cozy dwelling, accentuated by the shroud of snow that sits so gracefully upon the trees. The cheerful snowman wrapped in his red scarf, holding a straw broom, embodies the spirit of the season. I'm sure that my affection for the simple pleasures of life stems from my memories of growing up in the little town of Placerville. I roamed the California foothills with my friends, savoring the freedom and security of my boyhood, dreaming the dreams of childhood and having so many come true. This painting is a celebration of my own childhood memories. Covered bridges like this one were rarities in the Sierra foothills, but it seemed, at least in our boyhood imaginings, that big trout gathered in their shadowy depths. For me, the romance of San Francisco begins at Fisherman's Wharf. The Golden Gate Bridge stands as a welcoming sentinel, while sunset bathes the fog-shrouded air and glistens on the moist pavement. 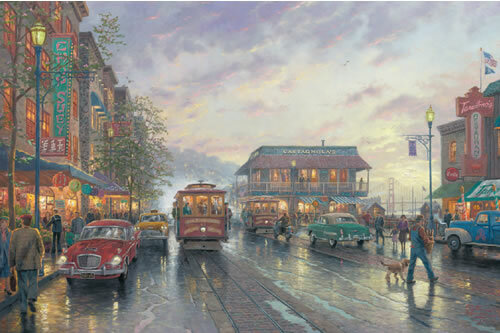 Aficionados of San Francisco will note my many romantic touches: replacing the contemporary wharf electric trolleys with the more colorful and nostalgic cable cars, clearing away some of the fishermen's shacks along Scoma's pier to allow a less interrupted view of the famous Golden Gate, dressing the scene with an uninterrupted flow of vintage vehicles. On the top floor of famous Castagnola's restaurant, I even included a depiction of myself as a little boy, looking out in awe at the distant bay as a fog-shrouded ship departs for points unknown.